This is going to make waves. To be written by the so-called Marvel architects – Brian Michael Bendis, Jason Aaron, Ed Brubaker, Jonathan Hickman and Matt Fraction – this event will pit the Avengers against the X-Men. Take two huge franchises, mash ‘em together = sell a lot of comic books. The Prologue issue comes out in March. 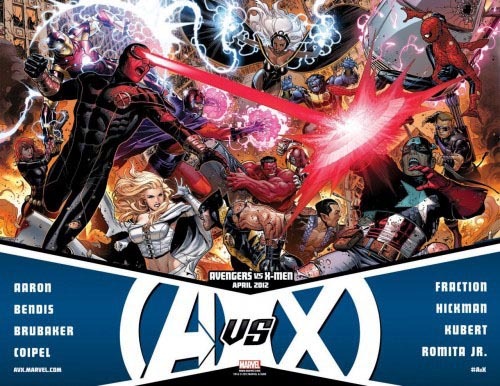 of course this is going to be a bi monthly book (probably $4)It will be interesting because of how intertwined the two teams are. I have said it before Marvel needs to give these events a break! They do not let characters develop on their own by throwing them into back to back events. In my opinion it hurts the quality of the books they are putting out. I’m going to skip this one out too Chance. I’m of the same opinion. Marvel may have been a leader in sales for a long time but their brand is slowly eroding from constant fan exasperation. But on the flip side, DC’s 52 was a weekly “event” book and it really helped out some lesser known characters and was a great collaborative effort. So this might be the project that repairs the PR damage Marvel has suffered lately.